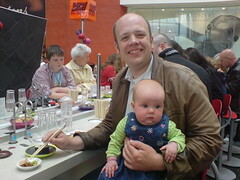 Today Thomas suggested we should go try the sushi bar in Silverburn shopping centre as we needed petrol at Tesco anyway. It turns out you can eat there for a reasonable price and it is fun to choose your dinner by colour-coded bowls rather than actually knowing what you are about to eat! We tried about 10 dishes for £25. The best, I think, was the salmon sushi, though I did like the deep-fried aubergines too. I was, however, touched by a slightly more adventurous couple, pictured here in the background of my photo. A grandson and grandmother sat down. He seemed genuinely pleased granny had joined him and asked what she was having. He took a prawn and rice something and tucked in with his chopsticks while she carried on cautiously watching the little dishes trundle by on the belt. Eventually, probably around when the octopus passed, she suddenly claimed not to be overly hungry and reached out to the belt. I was surprised this little old granny had the courage to try but of course she simply took the chocolate cheesecake in a little sushi bowl - one of only 3 desserts I saw passing while he ate all the other fishy delights.